When the story of the Stephen Harper government is told, historians will say that the week of March 17 to 23, 2013, is remembered, not for the release of a lacklustre federal budget, but for day after day of political blunders that undermined Harper’s goal of making a Canada what the Conservatives call a resource superpower. It was a week where spin overcame substance and spun out of control. The Conservative government’s aim was, apparently, to increase support for the Enbridge Northern Gateway pipeline project with a spin campaign aimed at moving the middle ground in British Columbia from anti-project to pro-project and at the same time launching a divide and conquer strategy aimed at BC and Alberta First Nations. It all backfired. If on Monday, March 17, 2013, the troubled and controversial Enbridge Northern Gateway project was on the sick list, by Friday, March 23, the Enbridge pipeline and tanker scheme was added to the Do Not Resuscitate list, all thanks to political arrogance, blindfolded spin and bureaucratic incompetence. The standard boogeymen for conservative media in Canada (who always add the same sentence to their stories on the Northern Gateway) “First Nations and environmentalists who oppose the project” had nothing to do with it. Stephen Harper has tight control of his party and the government, and in this case the billion bucks stop at the Prime Minister’s Office. He has only himself to blame. All of this happened on the northern coast of British Columbia, far out of range of the radar of the national media and the Ottawa pundit class (most of whom, it must be admitted, were locked up in an old railway station in the nation’s capital, trying interpret Finance Minister Jim Flaherty’s spreadsheets). The story begins early on that Monday morning, at my home base in Kitimat, BC, the proposed terminal for Northern Gateway, when a news release pops into my e-mail box, advising that Natural Resources Minister Joe Oliver would be in nearby Terrace early on Tuesday morning for an announcement and photo op. I started making calls, trying to find out if anyone in Kitimat knew about Oliver’s visit to Terrace and if the minister planned to come to Kitimat. I made those calls because in the past two years, Kitimat has seen a parade of visitors checking out the town and the port’s industrial and transportation potential. The visitors range from members of the BC provincial Liberal cabinet to the staff of the Chinese consulate in Vancouver to top executives of some of the world’s major transnational corporations (and not just in the energy sector). Most of these visits, which usually include meetings with the District of Kitimat Council and District senior staff as well as separate meetings with the Council of the Haisla Nation, are usually considered confidential. There are no photo ops or news conferences. If the news of a visit is made public, (not all are), those visits are usually noted, after the fact, by Mayor Joanne Monaghan at the next public council meeting. It was quickly clear from my calls that no one in an official capacity in Kitimat knew that, by the next morning, Oliver would be Terrace, 60 kilometres up Highway 37. No meetings in Kitimat, on or off the record, were scheduled with the Minister of Natural Resources who has been talking about Kitimat ever since he was appointed to the Harper cabinet. I was skeptical about that afternoon’s announcement/photo op in Vancouver by Transport Minister Denis Lebel and Oliver about the “world class” tanker monitoring. After all, there had been Canadian Coast Guard cutbacks on the northwest coast even before Stephen Harper got his majority government. The inadequacy of oil spill response on the British Columbia coast had been condemned both by former Auditor General Sheila Fraser and in the United States Senate. The government stubbornly closed and dismantled the Kitsilano Coast Guard station. It’s proposing that ocean traffic control for the Port of Vancouver be done remotely from Victoria, with fixed cameras dotted around the harbour. Leaving controllers in Vancouver would, of course, be the best solution, but they must be sacrificed (along with any ship that get’s into trouble in the future, on the altar of a balanced budget). The part of the announcement that said there would be increased air surveillance is nothing more than a joke (or spin intended just for the Conservative base in Alberta, Saskatchewan and the Toronto suburbs,that is not anyone familiar with BC coastal waters). Currently the Transport Canada surveillance aircraft are used on the coasts to look for vessels that are illegally dumping bilge or oil off shore. As CBC’s Paul Hunter reported in 2010, Transport Canada aircraft were used after the Gulf of Mexico oil disaster to map where the oil was going after it erupted from the Deepwater Horizon. Given the stormy weather on the west coast (when Coast Guard radio frequently warns of “hurricane force winds”) it is highly unlikely that the surveillance aircraft would even be flying in the conditions that could cause a major tanker disaster. Aerial surveillance, even in good weather, will never prevent a tanker disaster caused by human error. I got my first chance to look at the Transport Canada website in late afternoon and that’s when a seemingly innocuous section made me sit up and say “what is going on?” (I actually said something much stronger). Public port designations: More ports will be designated for traffic control measures, starting with Kitimat. (Transport Canada actually spelled the name wrong—it has since been fixed—as you can see in this screen grab). Kitimat has been one of the few private ports in Canada since the Alcan smelter was built and the town founded 60 years ago (the 60th anniversary of the incorporation of the District of Kitimat is March 31, 2013). The reasons for the designation of Kitimat as a private port go back to a complicated deal between the province of British Columbia and Alcan in the late 1940s as the two were negotiating about electrical power, the aluminum smelter, the building of the town and the harbour. For 60 years, Alcan, later Rio Tinto Alcan, built, paid for and operated the port as a private sector venture. For a time, additional docks were also operated by Eurocan and Methanex. 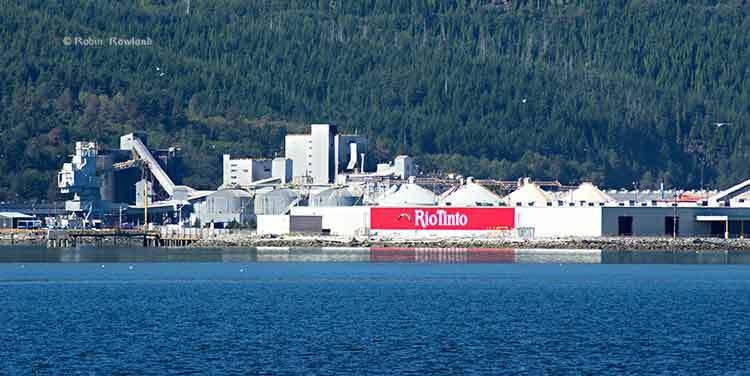 After Eurocan closed its Kitimat operation that dock was purchased by the parent company Rio Tinto. The Methanex dock was purchased by Royal Dutch Shell last year for its proposed LNG operation. The announcement that Kitimat was to become a public port was also something that the national media would not recognize as significant unless they are familiar with the history of the port. That history is known only to current and former residents of Kitimat and managers at Rio Tinto Alcan. The port announcement came so much out of left field; so to speak, that I had doubts it was accurate. In other words, I couldn’t believe it. I went to Monday evening’s meeting of District of Kitimat Council and at the break between the open and in-camera sessions, I asked council members if they had heard about Kitimat being redesignated a public port. The members of the district council were as surprised as I had been. Back from the council meeting, I checked the Transport Canada news release and backgrounders. I also checked the online version of Bill C-57, the enabling act for the changes announced earlier that day. There was no mention of Kitimat in Bill C-57. Tuesday morning I drove to Terrace for Joe Oliver’s 9 am photo op and the announcement at Northwest Community College (NWCC) that the government had appointed Douglas Eyford as a special envoy to First Nations for energy projects, an attempt on the surface to try and get First Nations onside for the pipeline projects, an appointment seen by some First Nations leaders as an attempt by the Harper government to divide and conquer. As an on site reporter, I got to ask Oliver two questions before the news conference went to the national media on the phones. For my second question, I asked Oliver if he planned to visit Kitimat. The question may not have registered with the national media on the conference call. For the local reporters and leaders in the room at Waap Galts’ap, the long house at Terrace’s Northwest Community College, everyone knew that Kitimat had been snubbed. Back in Kitimat, I sent an e-mail to Colleen Nyce, the local spokesperson for Rio Tinto Alcan noting that Joe Oliver had confirmed that the federal government intended to make the RTA-run port a public port. I asked if RTA had been consulted and if the company had any comment. Nyce replied that she was not aware of the announcement and promised to “look into this on our end.” I am now told by sources that it is believed that my inquiry to Nyce was the first time Rio Tinto Alcan, one of Canada’s biggest resource companies, had heard that the federal government was taking over its port. The next day, Kitimat Mayor Joanne Monaghan told local TV news on CFTK the Kitimat community was never consulted about the decision and she added that she still hadn’t been able to get anyone with the federal government to tell her more about the plan. Who pays for the navigation aids? Meanwhile, new questions were being raised in Kitimat about two other parts of the Monday announcement. New and modified aids to navigation: The CCG will ensure that a system of aids to navigation comprised of buoys, lights and other devices to warn of obstructions and to mark the location of preferred shipping routes is installed and maintained. Modern navigation system: The CCG will develop options for enhancing Canada’s current navigation system (e.g. aids to navigation, hydrographic charts, etc) by fall 2013 for government consideration. Since its first public meeting in Kitimat, in documents filed with the Northern Gateway Joint Review Panel, in public statements and advertising, Enbridge has been saying for at least the past four years that the company would pay for all the needed upgrades to aids to navigation on Douglas Channel, Wright Sound and other areas for its tanker traffic. It is estimated that those navigation upgrades would cost millions of dollars. Now days before a federal budget that Jim Flaherty had already telegraphed as emphasizing restraint, it appeared that the Harper government, in its desperation to get approval for energy exports, was going to take over funding for the navigation upgrades from the private sector and hand the bill to the Canadian taxpayer. This announcement was not discussed with Rio Tinto Alcan in advance. We are endeavoring to have meetings with the federal government to gain clarity on this announcement as it specifically relates to our operations in Kitimat. Nyce also gave a similar statement to CFTK and other media. A Francophone RTA spokesperson in Quebec did the same for Radio Canada. On Friday morning, Mayor Monaghan told Andrew Kurjata on CBC’s Daybreak North that she had had at that time no response to phone calls and e-mails asking for clarification of the announcement. Monaghan also told CBC that Kitimat’s development officer Rose Klukas had tried to “get an audience with minister and had been unable to.” (One reason may be that Oliver’s staff was busy. They ordered NWCC staff to rearrange the usual layout of the chairs at Waap Galts’ap, the long house, to get a better background for the TV cameras for Oliver’s statement). By Friday afternoon, five days after the announcement, Transport Canada officials finally returned the calls from Mayor Monaghan and Rose Klukas promising to consult Kitimat officials in the future. Monaghan said that Transport Canada told her that it would take at least one year because the change from a private port to a public port requires a change in legislation. Transport Canada is now promising “extensive public and stakeholder consultation will occur before the legislation is changed,” the mayor was told. Joe Oliver and the Harper government sent a strong political signal to Kitimat on Tuesday; (to paraphrase an old movie) your little town doesn’t amount of a hill of beans in this crazy world. Not that attitude is new for the people of Kitimat. The Northern Gateway Joint Review panel snubbed the town, bypassing Kitimat for Prince George and Prince Rupert for the current questioning hearings. Publisher David Black has been touting a refinery 25 kilometres north of Kitimat to refine the bitumen, but has never bothered to meet the people of Kitimat. There are a tiny handful of people in Kitimat openly in favour of the Northern Gateway project. A significant minority are on the fence and some perhaps leaning toward acceptance of the project. There is strong opposition and many with a wait and see attitude. (Those in favour will usually only speak on background, and then when you talk to them most of those “in favour” have lists of conditions. If BC Premier Christy Clark has five conditions, many of these people have a dozen or more). Oliver was speaking in Terrace, 60 kilometres from Kitimat. It is about a 40 to 45 minute drive to Kitimat over a beautiful stretch of highway, with views of lakes, rivers and mountains. Scenic Highway 37 is the route to the main location not only for the controversial Northern Gateway pipeline but three liquefied natural gas projects, not to mention David Black’s proposed refinery half way between Terrace and Kitimat. Why wouldn’t Kitimat be a must stop on the schedule for the Minister of Natural Resources? In Terrace, Oliver declared that Kitimat was to become a public port, run by the federal government. Although technically that would be the responsibility of Denis Lebel, the Minister of Transport, one has to wonder why the Minister of Natural Resources would not want to see the port that is supposedly vital to Canada’s economy? You have to ask why he didn’t want to meet the representatives of the Haisla Nation, the staff and council of the District of Kitimat and local business leaders? Oliver has been going across Canada, the United States and to foreign countries promoting pipelines and tanker traffic, pipelines that would terminate at Kitimat and tankers that would send either bitumen or liquefied natural gas to customers in Asia. Yet the Minister of Natural Resources is too important, too busy to take a few hours out of his schedule, while he is in the region, to actually visit the town he has been talking about for years. He told me that he had to be in Ottawa for the budget. Really? The budget is always the finance minister’s show and tell (with a little help from whomever the Prime Minister is at the time). On budget day, Oliver would have been nothing more than a background extra whenever the television cameras “dipped in” on the House of Commons, between stories from reporters and experts who had been in the budget lockup. According to the time code on my video camera, Oliver’s news conference wrapped at 9:50 a.m., which certainly gave the minister and his staff plenty of time to drive to Kitimat, meet with the representatives of the District, the Haisla Nation and the Chamber of Commerce and still get to Vancouver for a late flight back to Ontario. On Tuesday, Joe Oliver’s snub pulled the political rug out from under the Northern Gateway supporters and fence sitters in Kitimat. Oliver’s snub showed those few people in Kitimat that if they do go out on a limb to support the Northern Gateway project, the Conservatives would saw off that limb so it can be used as a good background prop for a photo op. Prince Rupert, Terrace and Smithers councils have all voted against the Northern Gateway project. Kitimat Council, despite some clear divisions, has maintained a position of absolute neutrality. Kitimat Council will continue to be officially neutral until after the Joint Review report, but this week you could hear the air slowly leaking out of the neutrality balloon. Oliver may still believe, as he has frequently said, that the only people who oppose Northern Gateway are dangerous radicals paid by foreign foundations. What he did on Tuesday was to make the opposition to Northern Gateway in Kitimat into an even more solid majority across the political spectrum. It doesn’t do much for the credibility of a minister of natural resources to thoroughly piss off, for no good reason, the world’s second largest mining and smelting conglomerate, Rio Tinto. But that’s just what Joe Oliver did this week. I am not one to usually have much sympathy with rich, giant, transnational corporations. But look at this way, over the past 60 years Alcan and now Rio Tinto Alcan have invested millions upon millions of dollars in building and maintaining the Kitimat smelter and the port of Kitimat. RTA is now completing the $3.3 billion Kitimat Modernization Project. Then without notice, or consultation, the Conservative government—the Conservative government—announces it is going to take over RTA’s port operations. What’s more, if what Transport Canada told Mayor Joanne Monaghan is correct, the federal government is going to start charging RTA fees to use the port it has built and operated for 60 years. Too often RTA’s London headquarters acts like it is still the nineteenth century and the senior executives are like British colonialists dictating to the far reaches of the Empire on what do to do. There’s one thing that you can be sure of, Rio Tinto Alcan’s lobbyists are going to be earning their fees in the coming weeks. (One more point, even if there wasn’t a single pipeline project planned for Kitimat you would think that the Minister of Natural Resources would want to see what is currently the largest and most expensive construction project in Canada, a project that comes under his area of political responsibility). Douglas Channel is in the traditional territory of the Haisla Nation. The KM LNG project at Bish Cove is on Haisla Reserve No. 6 legally designated an industrial development by the federal government. Any changes to that project and to the Kitimat waterfront as a whole will require intensive negotiations with the Haisla Nation. It took five days, from the time of the minister’s news conference on Monday until Friday afternoon, for officials in Transport Canada to return phone calls from Mayor Joanne Monaghan and Rose Klukas, to explain what was going to happen to the Port of Kitimat. This week was yet another example of the decay of Canadian democracy under Stephen Harper. Executives from Tokyo to Houston to the City of London quickly return phone calls from the District of Kitimat, after all Kitimat is where the economic action is supposed to be. At the same time, the federal government doesn’t return those calls, it shows that something really is rotten in our state. There are three liquefied natural gas projects slated for Kitimat harbour, the Chevron-Apache partnership in KM LNG, now under construction at Bish Cove; the Royal Dutch Shell project based on the old Methanex site and the barge based BC LNG partnership that will work out of North Cove. None of these projects have had the final go ahead from the respective company board of directors. So has the federal government thrown the proverbial monkey wrench into these projects? Will making Kitimat a public port to promote Enbridge, help or hinder the LNG projects? Did the Ministry of Natural Resources even consider the LNG projects when they made the decision along with Transport Canada to take over the port? Kitimat has a marina shortage, especially since RTA closed the Moon Bay Marina. The only one left, the MK Bay Marina, which is straining from overcapacity, is owned by the Kitimat-Stikine Regional District. That means there will be another level of government in any talks and decisions on the future of the Kitimat harbour. There are also the controversial raw log exports from nearby Minette Bay. Although Transport Canada has promised “extensive public and stakeholder consultation,” one has to wonder how much input will be allowed for the residents of Kitimat and region, especially the guiding and tourism industries as well as recreational boaters. After all, the Harper government is determined to make Kitimat an export port for Alberta and the experience of the past couple of years has shown that people of northwest count for little in that process. Just look at the Northern Gateway Joint Review, which more and more people here say has no credibility. Big blunder or more of the same? I’ve listed five big blunders that are the result of the decision by the Harper government to turn Kitimat into a public port. Are they really blunders or just more of the same policies we’ve seen from Stephen Harper since he became a majority prime minister? This is a government that has muzzled scientific research and the exchange of scientific ideas. The minister who was in the northwest last week, who has demonized respect for the environment, is now squeezing the words “science” and “environment” anywhere into any message track or speech anyway he can. The government closes the busiest and most effective coast guard station at Kitsilano without consulting a single municipal or provincial official in British Columbia. The government closes two of Canada’s crown jewels of scientific research, the Experimental Lakes Area in Ontario and the Polar Environmental Research Laboratory in Nunavut. Keeping the coast guard station and the two science projects open and funded would be a drop in the deficit bucket at a time that the government is spending countless millions of taxpayers’ dollars in promoting itself on every television channel in Canada. That’s just the point. Joe Oliver’s fly-in, fly-out trip to Terrace was not supposed to have any substance. Changing the chairs at the Waap Galts’ap long house showed that it was more important to the Harper government to have some northwest coast wall art behind Joe Oliver for his photo op than it was to engage meaningfully with the northwest, including major corporations, First Nations and local civic and business leaders. 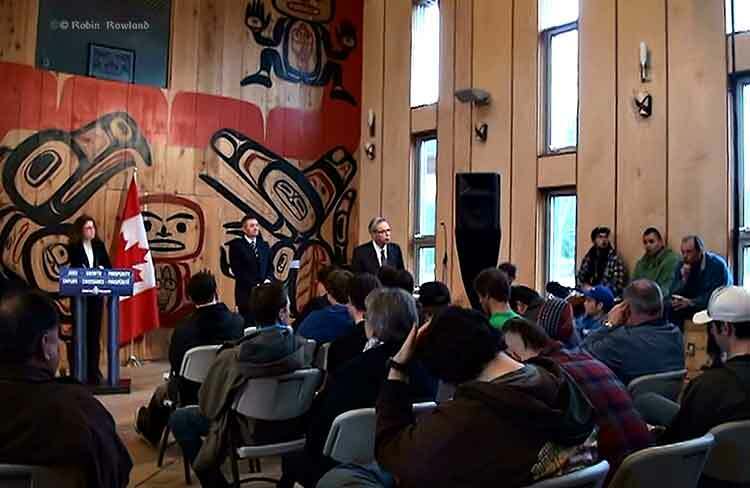 Joe Oliver’s visit to Terrace was an example of government by reality television. The decision to change the private port of Kitimat into a public port was another example of Harper’s government by decree without consulting a single stakeholder. The problem is, of course, that for decades to come, it will be everyone in northwest British Columbia who will be paying for those 30 second sound bites I recorded on Tuesday. If an NDP or Liberal government had done what Harper and Oliver did on Monday, every conservative MP, every conservative pundit, every conservative media outlet in Canada would be hoarse from screaming about the danger from the socialists to the Canadian economy. That brings us to the legacy left by R. E. Powell who was president of Alcan in the 1940s and 50s as the company was building the Kitimat project. According to the book, Powell sought to anticipate any future problems, given the tenor of the times, the possible or even likely nationalization of the smelter and the hydro-electric project. Whereas the government is unwilling to provide and risk the very large amounts of money required to develop those water powers to produce power for which no market now exists or can be foreseen except through the construction of the facilities for the production of aluminum in the vicinity and…. Whereas the construction of the aluminum plant at or near the site of the said waterpower would accomplish without risk or to the GOVERNMENT the development power, the establishment of a permanent industry and the new of population and…. I asked the political leaders of BC if the government would develop the power and sell the energy to Alcan and they refused. We had to do it ourselves. Someday, perhaps, some politician will try to nationalize that power and grab it for the state. I will be dead and gone but some of you or your successors at Alcan may be here, and I hope the clauses in the agreement, approved by the solemn vote of the BC legislature, will give those future socialists good reason to pause and reflect. In the late 1940s and early 1950s, the federal government had very little to do with the Kitimat project. With the declaration that Kitimat will be a public port, the federal government comes to the party 60 years late. But one has to wonder if the late Alcan president, R.E. Powell, ever considered that the “future socialists” he hoped would “pause and reflect” would be members of Canada’s Conservative party, Stephen Harper, Joe Oliver and Denis Lebel?